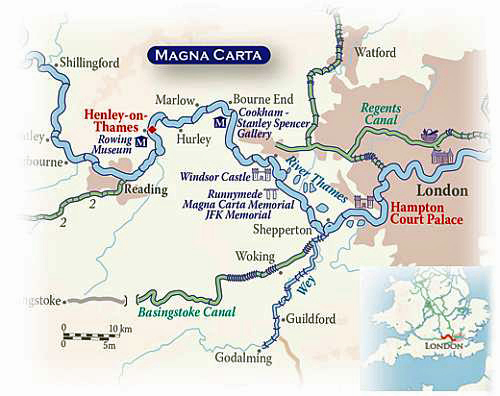 Luxury river barge cruise vacations on the English hotel barge MAGNA CARTA cruising the Royal River Thames. Based in London England. Meet the Captain or a crew-member at the designated meeting point for afternoon English Cream Tea, before being transferred to the Magna Carta, moored along the famous Henley Royal Regatta course. On arrival guests receive a "Champagne Welcome" by the Captain and crew. Dinner on board. This morning we take a 40-minute drive to Oxford for a fascinating tour of Christ Church, Oxford's grandest college. Unusually, it was founded twice, once by Cardinal Wolsey and then by King Henry VIII. The magnificent surroundings were where Lewis Carrol wrote Alice in Wonderland. After lunch we set sail and cruise the famous Regatta Mile. Here, every year in July rowing teams from around the world compete in front of Champagne and Pimms fueled crowds. We pass through Hambledon Lock, and onwards through stunning countryside to the medieval village of Hurley. We wander through Peter Freebody's boatyard and watch in wonder as the traditional craftsmen build and restore classic wooden craft as they have for generations. Afterwards we have time to explore the ancient village including Ye Olde Belle, reputed to be the oldest inn in the country before returning to the barge. Dinner on board. This morning we cruise through magnificent scenery past the riverside towns of Marlow, Bourne End and Cookham and down into the spectacular Clivedon reach where we have special permission to moor at the house itself. After lunch we visit Cliveden Estate and Gardens. This magnificent estate, former home of Lord and Lady Astor, boasts amazing views and incredible gardens. First laid out in the 18th century they include a formal parterre, a wonderful water garden with a restored Pagoda made for the Paris Exhibition of 1867, a long garden with topiary and 18th century Venetian statues. Truly stunning. A late afternoon cruise takes us to our stunning overnight mooring in Cookham. Dinner on board. Artist Sir Stanley Spencer, one of England's greatest and most eccentric painters, once described Cookham as "Heaven on Earth". Much of his work was painted in and around the village. This morning, after breakfast we visit Stanley Spencer’s gallery and admire some of his paintings. 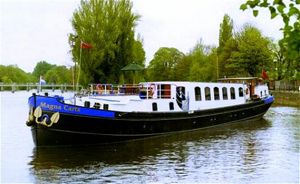 Our afternoon cruise takes us through Maidenhead and Boulters Lock (made famous in Victorian times), past fabulous waterside homes in Bray and down to the heart of Windsor. This afternoon we visit the stunning Savill Garden. Savill Garden comprises over 1,500 hectares of Windsor Great Park maintained by the Crown Estate and contains a diverse range of land uses. Over 60% of the Great Park is open to the public and it is estimated that more than 3 million visits are made each year. The Gardens Department is responsible for 600 hectares of the Great Park including the Savill Garden. There is also an optional visit to the nearby Wisley Gardens which is 200 acres of botanic gardens, famous for their trials of new varieties. Dinner on board. This morning we cruise to Shepperton taking us through 6 locks in total and passing through Runnymede. Here in 1215 the Magna Carta was sealed and we can see the memorial from the boat. After lunch we visit the famous Kew Gardens. With the new Bonsai collection, Palm House where all the plants have their first flush of new growth and tropical water lilies are opening their exotic blooms in the nearby Waterlily House. Plants of a smaller stature or scale can be seen in the Rock Garden and here plants from the world’s mountain ranges are grown alongside Mediterranean species, both enjoying the open, sunny position and free-draining soil. Dinner on board. Morning cruise to Hampton Court Palace which is our final mooring. After lunch we visit the show! Hampton Court Palace Flower Show, set in 25 acres of Royal parkland, where ingenious design, original ideas and creative flair, combine to inspire. Organized by the Royal Horticultural Society, nurseries, societies and charities create 25 colour filled traditional and contemporary gardens in the grounds of Hampton Court Palace, including spectacular water gardens. There are also stunning floral displays in 8 huge marquees, including the British Rose Festival, plus much, much more. Captain's Farewell Dinner on board. Following breakfast, disembark the barge for your transfer to the designated drop off point.